How to Make Ringtones for iPhone? You may have a gigantic collection of songs in your music library but find no way to make ringtones from any of them. 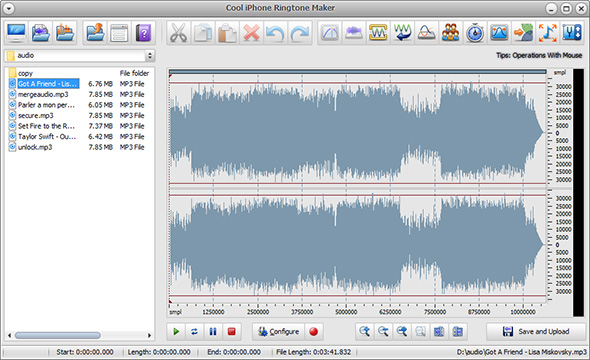 Cool iPhone Ringtone Maker is exactly designed to create iPhone ringtones from any songs easily for free. 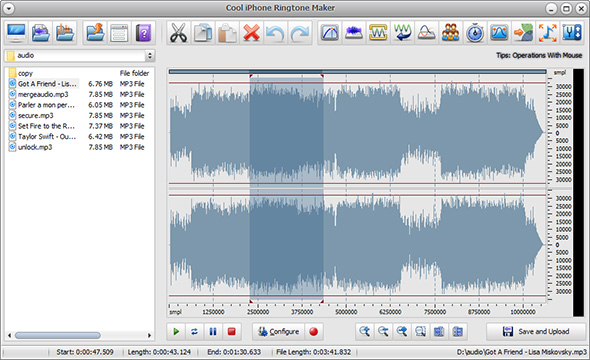 This post will show you How to Make Ringtones for iPhone with this free ringtone maker software. Launch Cool iPhone Ringtone Maker. Click “Open My Desktop folder”/”My Music”/”My Ringtones” to select an audio file from your computer and input it to the program. 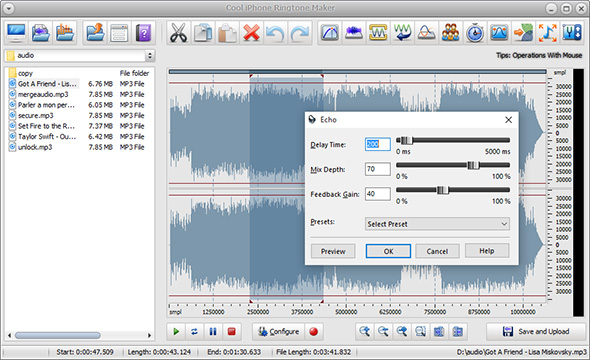 The added file will be displayed in waveform window which is convenient for visual editing. There are many ways to select a part of the audio file: Click anywhere of the waveform as a start point and use hotkey like Shift+Home, Shift+End to select from start/end; Click the left button and drag along with the waveform to the place wanted to be selected. Now perform some editing operations to the selection by clicking the buttons of cut, copy, paste, crop, delete, etc. and add some audio effects like echo, fade-in/fade-out to the file. Then, adjust the volume with an amplifier or a normalizer. You may specify the detailed effect parameters or use the presets provided. You can also mix the current file with another audio file. All the operations can be redone or undone. Preview selected part by clicking on the play button until you are satisfied with the result. Click “Save and Upload” to choose an output folder for the edited file. Select an output format from MP3, WMA, WAV and OGG in the “Save as type”drop-down list. Then, click “Save” to use the presets or specify the configuration parameters to adjust the output quality for every format. Click “OK” to output the ringtone. Now, assign a specific iPhone ringtone to individual contacts in your iPhone, or choose the new made iPhone ringtone to play as an alarm.